Autumn is important for us eaters (and drinkers). That’s when farmers rush to harvest crops before the first frost. Then they take those crops to market—which is how the rest of us get fed. Earth’s natural satellite (aka the moon) even helps celebrate the harvest: Every autumn we enjoy a particularly notable full moon called the “Harvest Moon” (more on that in the Notes). Here in the US, some of autumn’s bounty traditionally has been distilled into applejack—a hard cider made from North American apples. 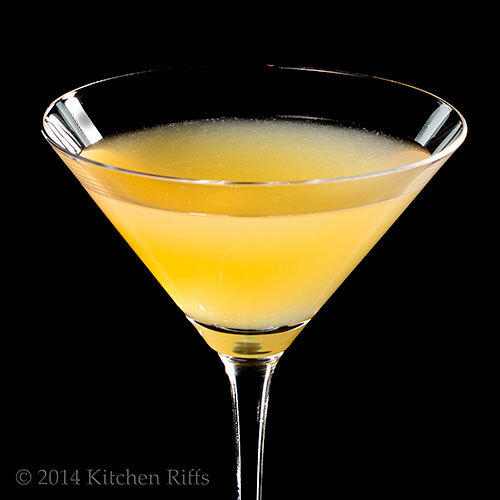 And applejack just happens to be used in a classic cocktail called the Harvest Moon. Appropriate, don't you think? 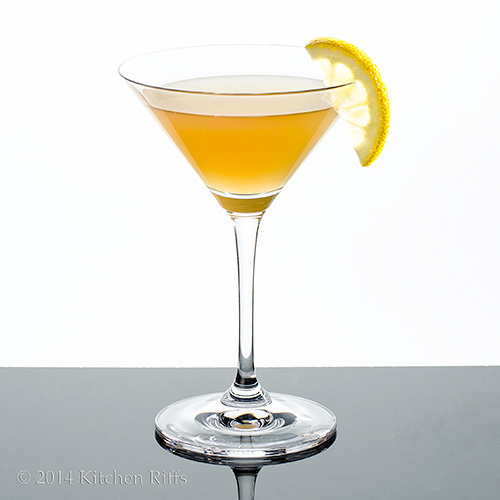 Many of today’s imbibers have never tasted a Harvest Moon Cocktail. If you’re among them, get ready for a treat. Just mix up one of these gems, and you may be dancing by the light of the moon. We learned about this drink from Robert Hess’s wonderful cocktail website, Drink Boy. Hess also has a video in which he shows how to mix this drink—and goes into a bit more detail about how he discovered it. Hess found a reference to this drink while browsing the December 1934 issue of Esquire magazine. He saw an article listing the “Top 10” cocktails of the year. It featured classics like the Old-Fashioned and the Daiquiri. But it also included a drink called the Harvest Moon, which was described as an “applejack sour with orgeat.” It didn’t include a recipe, though. Bummer. Hess (a renowned cocktail expert) had never heard of the drink, and he couldn’t track down the original recipe—or even discover how the drink got its name. So being the resourceful (and thirsty) imbiber that he is, Hess decided to reverse engineer the drink based on the information he had. Our recipe is based on the one Hess devised. 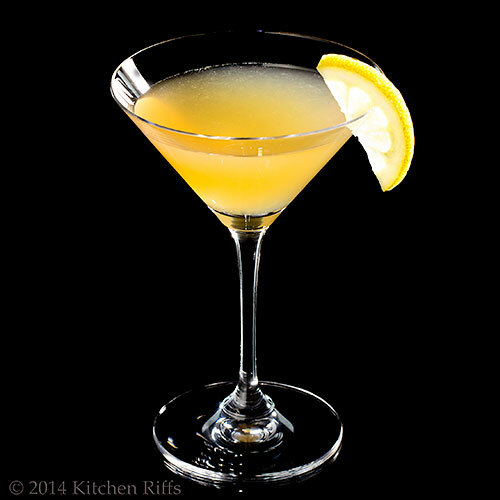 We substitute lemon juice for the lime he specifies (we think it makes a better drink). You may want to try it both ways though, and see which you prefer. Place all ingredients (except garnish) in a cocktail shaker half-filled with ice. Shake vigorously until the shaker is frosted and the drink is thoroughly chilled (about 20 seconds). Strain the contents of the shaker into a cocktail glass, preferably one that’s been chilled. Garnish with a slice or twist of lemon, if you wish. Serve and enjoy. The only brand of applejack that’s readily available in the US is one made by Laird & Company. You’ll most often see the 80-proof version. But if you have a chance to buy their bonded (100 proof) version, do so—the flavor is superior. If you can’t find applejack, you can use French calvados (which is essentially brandy made from apples). It’s an excellent (albeit pricey) substitution. Orgeat is a sweet syrup that’s flavored with almonds and orange or rose water. Many liquor stores carry it these days. It’s also available online (Google is your friend here). Torani is one brand of orgeat that tends to be widely available and of decent quality. If you can’t find orgeat, check the coffee aisle at your supermarket for almond syrup (a popular flavoring). Although almond syrup doesn’t contain orange/rose water, its flavor is very similar to orgeat. Why shake this cocktail? Because it helps make the drink cold. But more importantly, it helps thoroughly integrate all the ingredients, particularly the citrus juice. 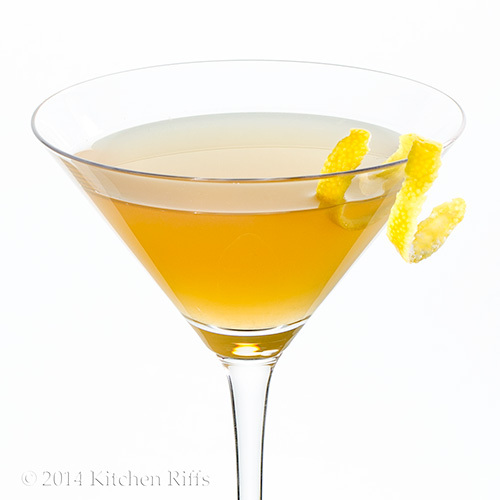 When a drink contains citrus, it’s difficult to incorporate just by stirring. Astronomically speaking, a “Harvest Moon” is the full moon that occurs nearest the autumnal equinox (which rolls around in September in the northern hemisphere, March in the southern). What’s special about a Harvest Moon? Well, a full moon always rises around the time the sun sets. Then as the phase wanes, the moon typically rises about 50 minutes later each night (that’s approximate, depending on your latitude). But around autumnal equinox, because of the moon’s orbital path, it rises only about 30 minutes later for several days. And because it rises early in the evening, there’s an abundance of conveniently timed moonlight—which is helpful for those working late to get in the harvest. In parts of China, the Harvest Moon is celebrated by eating mooncakes (a round pastry often filled with red beans or lotus seed paste). A Japanese video game called Harvest Moon lets you role play at farm simulation. There’s also a song by Neil Young called (drum roll) “Harvest Moon.” And if you know it, you’ve probably got the song playing in your head right now. Sorry about that. That’s when Mrs K R wadded up her cocktail napkin and threw it at me. Neil Young is a personal favorite of mine. I do believe his birthday is this month. Oh good, another reason to toast with a Harvest Moon. BTW, the song that's now playing in my head is...Oh, Shine on, shine on, harvest moon, Up in the sky; I ain't had no lovin' Since April, January, June or July. No, I'm not as old as vaudeville or Eddie Cantor for that matter but I do know that song and now the whole neighborhood may be hearing it too! Thanks for that John and thank you for sharing this recipe! After not getting through all 280 boxes, I must say that I am more than ready for a harvest moon of any sort. My brain is totally fried, and just staring at the moon would comfort me. A drink in hand would be a bonus! Like Louise, I want to sing the song now. :) What a delightful drink for the fall! I've never had applejack but I have sipped on some Torani with great pleasure. I can only imagine how wonderful these combined flavors are, especially with that hint of lime. Fun post John and so timely as I see here looking at the fall colors out the window. I so love the history and stories you share behind the drinks you post - this is another beaut! Hi Kumar, this really is a nice sipper -- awesome flavor! Thanks for the comment. Hi Louise, LOL -- I almost used "Shine on" for the song in the post. But like Neil Young's better, so went with that. Thanks for the comment. Hi Abbe, moving is tough work! You need one of these. Maybe two. :-) Thanks for the comment. This is a great name for a cocktail that is actually a treat. Cheers! Hi MJ, applejack is really worth tracking down -- it's nice stuff. And this cocktail is really lovely! Thanks for the comment. HI Shashi, although I love the flavor of cocktails, it's really their history (and good looks!) I find most interesting. Thanks for the comment. Hi Denise, isn't the name of this wonderful? As is the flavor! Thanks for the comment. I just love the moon. When I wake up in the middle of the night I sometimes look for it. Last night I saw either the big or little dipper and the beautiful moon in the night sky all from the windows in my house. It was stellar! I'm sure this cocktail is too! I really enjoyed the colour of this cocktail (considering I can't taste it :P) but it looks perfect for autumn! A little twist of lemon on the side makes it perfect! Hi Dottie, this is one of those drinks that's pretty smooth -- you barely know you're drinking alcohol. Which isn't necessarily a good thing! Thanks for the comment. Hi Julia, applejack is such a great fall drink -- worth picking up a bottle sometime. ;-) Thanks for the comment. Hi Laura, the night sky is so interesting, isn't it? As, of course, is this cocktail. ;-) Thanks for the comment. Hi Uru, the colors are great, aren't they? And I can assure you, sure is the flavor. :-) Thanks for the comment. Hi Rocquie, sorry about that song thing. ;-) And dancing in the moonlight is always a good thing! Thanks for the comment. Hi Maureen, this would be a lovely drink the the spring. For planting season, you know. :-) Thanks for the comment. Hi John , what a beautiful drink , you have many , many cocktails and we love each and everyone of them down here . Wow, John, what an exotic blend! I am absolutely in love with the name of this cocktail... for some reason the words 'Harvest Moon' have always made me swoon. NEVER have I ever heard of AppleJack before! But I have heard of AppleJacks! LOL! Oh wow this one is gorgeous --- like a pool of golden moonlight! I love orgeat syrup, I have a humungous bottle that needs to be used...I'm going to mix up one of these this week, for sure. Hi Nee, it'd be fun to have moonshiners in the family! ;-) It's definitely worth tracking down applejack -- lovely stuff. Thanks for the comment. Hi LIzzy, happy to write about something that makes you swoon! :-) Thanks for the comment. Hi GiGI, applejack is much more interesting than Applejacks! :-) Thanks for the comment. Hi Sue, doesn't orgeat have a wonderful flavor? I love it in this. And it's also wonderful in a Mai Tai. Thanks for the comment. Sounds so good! And i love the name - "Harvest Moon" sounds very much like a drink from the 30's, so i'm unsurprised by the Esquire find there. Good tips in the note section, too: i'm not altogether well-versed in applejack or orgeat, but now i feel like i sort of know what i'm doing. :) I notice you mentioned almond syrup as a substitute for orgeat, but you mentioned too that it's without the orange or rose water, which no doubt contributes lovely flavor. I don't know the ratios here or how much one would add to the almond syrup, but you can find both orange blossom and rose water at international food markets like Global Foods in Kirkwood. Great recipe, though: i feel like i'd love the flavors in this. Hi Zoe, you and your hubby will enjoy this! :-) Thanks for the comment. Hi Shannon, this drink really is lovely -- I'll bet you'd love it! The flavor of orange/rose water in orgeat really is very faint. Probably for the amount of almond syrup you'd use in this drink, maybe a couple of drops of the flavored water. Pretty easy to skip in this case. But orgeat is pretty easy to find at most liquor stores these days (in St. Louis, it wasn't even 5 years ago), so that's what I'd look for first. Thanks for the comment. Thanks for the recipe John...hope you are having a nice week! Hi Juliana, I agree -- mooncakes are good, but this cocktail is better! Thanks for the comment. A lovely name for a cocktail. So petic. Those flavors are wonderful. Ok I'm posting my comment again because I didn't see that it was waiting for approval and didn't show up. This drink sounds wonderful and full of flavor. I've never heard of orgeat but I'm pretty sure I'll like it. As you know I'm not much of a drinker but this one is calling out my name. Thanks for sharing the recipe. Hi Rosa, this really is a most excellent cocktail. One of our new favorites! Thanks for the comment. Hi VIcki, glad you posted again -- apparently Blogger had a hiccup, because your first comment never showed up! Anyway, orgeat is wonderful stuff -- lovely flavor. And if you don't like it in drinks, it's great in coffee! Thanks for the comment. Yum - it looks and sounds delicious! I am quite familiar with calvados including apple. But you know I pretty sure I have never had apple jack. Interesting history---popular in 1934 huh. Well like lots of the responders I love the color. I don't mind that you put a song lyric in my head. But my co-workers probably won't, since I will probably be singing the one or two lines I know over and over. I wonder what my work day would be like if I started out with one of these cocktails. Made myself laugh! Harvest moon is a great name! Lovely flavour combination. I love this post! I love how you describe this, your writing is great. Sounds lovely! Hi Pam, it is. :-) Thanks for the comment. Hi Greg, this is quite good with lime. And although I normally really like lime in cocktails -- particularly with orgeat -- lemon just seems to work better to me. Thanks for the comment. Hi Carol, probably not a good idea to start your day with one of these. ;-) My apologies to your coworkers. :-) Thanks for the comment. Hi Caroline, isn't it a fun name? And a fun drink! Thanks for the comment. Hi Holly, this is a great drink -- hope you get to try it at some point. Thanks for hte comment. Hi John, great post, sounds like a wonderful drink, never heard of orgeat syrup before. Will be making these for the hubs and I.
Hi Cheri, I think you'll both enjoy this -- it has such wonderful flavor! Thanks for the comment. Hi Smidge, Aperol is more like Campari -- very different flavor profile (might be fun to try it in a Negroni, however). Applejack has wonderful flavor so it's worth seeking out. And you can use orgeat in so many drinks (or in coffee), so that's worth looking for too. Thanks for the comment. The song started going through my head as soon as I read the title of your post. I don't mind though - I'd be okay with humming it for the rest of the day. Hi Charlie, isn't this pretty? And it's the weekend, so you know what we'll be drinking. :-) Thanks for the comment. Hi John, if you like sours (and almost everyone does), this really is a good one! Such a nice flavor -- orgeat works so well with citrus. Thanks for the comment. Hi Beth, :-) Hard to avoid talking about that song, isn't it? Thanks for the comment. Hi Lea Ann, happy Friday morning to you! And it'll be a happy Friday evening if you decide to make one of these for cocktail hour. :-) Thanks for the comment. This looks like a perfect way to toast the fall season! Lemon sounds like a great choice with the apple flavor. Can't wait for five o'clock. This looks so beautiful, John..... I have never tried a Harvest Moon but you are tempting me! Hi Lisa, well you know it's five o'clock somewhere. :-) Thanks for the comment. Hi Pat, our blogs are all about temptation, aren't they? :-) Thanks for the comment. So simple but so pretty. It does resemble a harvest moon! Hi Chris, the best cocktails tend to be the simple ones, IMO. Well, most of the best. :-) Thanks for the comment. Love the background stories when reading your cocktail posts . Hi Daniela, so many drinks have interesting stories! And they're all pretty. :-) Thanks for the comment. that song Harvest Moon, oh I love it....it's so touching and the first time I heard it it made me cry. Simply nice and elegant drink!!! HI Dawn, that's a nice song, isn't it? And this is a nice cocktail! Thanks for the comment. Hi Liz, sorry about the song. :-) Thanks for that very kind comment. Hi Dedy, it really is a super drink! Thanks for the comment. What wonderful flavors this must have!! Gorgeous photos, too. Hi Ashley, it's a wonderful drink! Thanks for the comment..
What a lovely drink! Back quite a few years ago, my husband tried to make a sort of hard cider/wine that he had read about. It was dreadful, and made your breath smell like airplane glue. This sounds SO much better! Hi Taruna, isn't it nice? And it's really worth trying -- hope you get a chance! Thanks for the comment. Hi Donalyn, I remember that airplane glue from when I was a kid and made model airplanes. Horrible stuff -- I'd hate to drink anything that had that bouquet! This doesn't, I promise. :-) Thanks for the comment. That harvest moon has been spectacular the end of last week. Not as spectacular as this cocktail, however. Lovely pics. Hi Debra, the moon's been great, hasn't it? Really gorgeous. Thanks for the comment. Hi Marta, sorry to tempt you with booze when you can't drink it! But soon you will. :-) Thanks for the comment. I love autumn - it's my favorite time of year with the best (in my opinion) foods like winter squash, apples, etc. This cocktail looks like a perfect way to celebrate the best season! Cheers! Love the name of this, I used to play a game with the same name. The color on this is just fantastic! Hi Bam, applejack is really nice -- somewhat similar to brandy. Thanks for the comment. Hi Helene, applejack is probably most similar to calvados in flavor. Slightly different flavor profile, however. It's really nice -- hope you get to taste it someday! Thanks for the comment. Hi Amy, fall is my favorite season, too. Love the cool (not cold) weather, and I agree the food is wonderful! Thanks for the comment. Hi Pamela, I know of the farm simulation game, though I haven't played it. Sounds like fun! Thanks for the comment. Hi Raymund, it's definitely worth finding both ingredients! This is one terrific cocktail. Thanks for the comment. Whoa, that's lots of Harvest Moon facts! Love it when you do that, John :). Thanks for sharing!!! Hi Julie, I love useless facts! The more the better. ;-) Thanks for the comment. I enjoyed the Neil Young nod, but I'm one who hasn't tasted a Harvest Moon cocktail. That will change, John. Pinned for Happy Hour very soon. Thanks for sharing the recipe! Hi Brooks, I think you'll enjoy this drink -- wonderful flavor. Thanks for the comment. I didn't think cocktails can be seasonal but it is with the ingredients! I love the stories behind Harvest Moon. This is a very delightful and beautiful cocktail! Hi Nami, isn't this such a pretty cocktail? And the flavor is wonderful! Thanks for the comment. Hi Hungry Mum, sounds like a deal! :-) Thanks for the comment. Hi Kiran, this really is a great drink -- very nice flavor, wonderful color. Thanks for the comment. Never heard of orgeat and thought applejack was for moonshiners. So what do I know? I do happen to have some Calvados ... now to find orgeat and dance by the light of the moon. Hi Claudia, Calvados and applejack are pretty similar (slightly different flavor profiles, though, although that doesn't matter in this drink IMO). Have fun dancing! Thanks for the comment.